The global market for vacuum insulation panels is projected to grow at a steady rate during the forecast period of 2017 to 2026. The leading players in the market are putting conscious efforts and spending more on intensive research activities that will help in developing cheap core material for vacuum insulation panels. The author of the report has also analyzed that these efforts in research will help to meet various requirements from end-use industries. Some of the key players in the market include Panasonic, Sofrigram SA Ltd., American Aerogel Corporation, Pelican BioThermal LLC, Cryopak, Sealed Air Corporation, Evonik Industries AG, Cold Chain Technologies, Inc., Sonoco, Dow Corning, va-Q-tec AG, and LG Hausys. The leading players emphasizing in developing innovative products to strengthen their foothold in the market and maintain a leading position from others. The TMR report also analysis the market valuation that is expected to cross US$9bn by the end of the forecast period of 2026. The global market for vacuum insulation panels is anticipated to grow at 5.3% of CAGR during the tenure between 2017 to 2026. Silica, a core type of material is used in vacuum insulation panels is expected to dominate the market by reaching a valuation of US$ 4.2 bn by the end of the tenure. The regional analysis estimated that the Asia Pacific excluding Japan (APEJ) as a lucrative market for vacuum insulation panels. 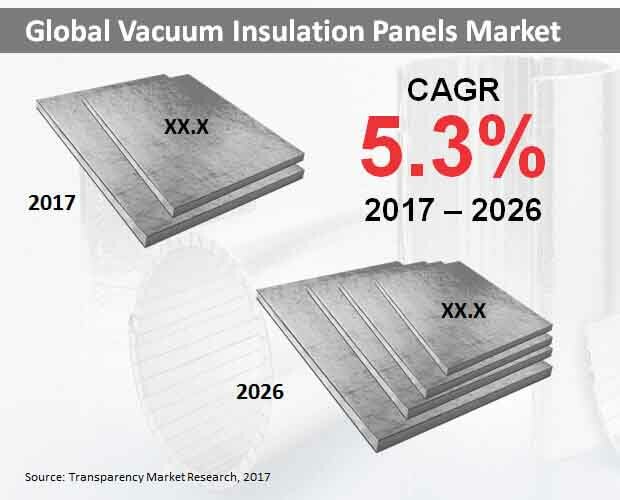 India, China, and Australia are some of the prominent regions having logistics, pharmaceuticals, construction and refrigeration industries that will boost the demand for vacuum insulation panels. The demand for vacuum insulation panels has significantly grown in the commercial refrigeration applications in numerous ways. The increasing number of transportation of refrigerated food products has remarkably increased the demand for vacuum insulation panels that will further expand the market avenues in coming years. Pharmaceutical industry is also using these panels at an extensive rate. As these panels help in managing temperature excursion for various pharmaceutical products and other drugs that will accentuate the demand in coming years. Vacuum insulation panels provide effective temperature control system that helps in maintaining drug quality during transportation. Logistics and refrigerated shipping have also pushed the demand for these panels as they widely reduce the fuel consumption in transporting vehicles. Increasing building construction has significantly augmented the demand for vacuum insulation panels that enhances the energy efficiency of various construction material. Emerging economies are opening huge opportunities for the vacuum insulation panels market due to increasing infrastructural developments. Additionally, retrofit insulation is highly preferred in building, thus it will flourish the demand for vacuum insulation panels during the forecast period. Moreover, the use of vacuum insulation panels is much more effective than the traditional foam insulation in various refrigeration applications is also expected to boost the market.